When living alone is no longer an option, there is a decision that you and your family can feel confident about. Moving to Caregivers Inn can be the beginning of a new chapter in your life, and one that you can fully and earnestly trust. 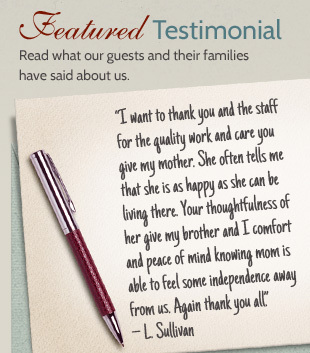 Caregivers Inn is a residential care home located in O'Fallon, Missouri. Since first opening our doors in March of 1990, we have been providing residents with the highest quality services and a down home atmosphere with all the comforts of old fashioned living. From our exceptional staff to our welcoming environment, numerous amenities, broad range of scheduled activities, field trips and personal care, Caregivers Inn is focused on senior living with dignity, and is truly one of a kind. Resting in the heart of a residential community on a beautiful six acres of property, our home holds 30 licensed residential care beds in a country style home setting. Our services and amenities are outstanding and provide all the comforts of home. We provide three well-balanced meals a day, 24/7 assistance with daily living, administration of medications, housekeeping and laundry services, a beauty salon and barber shop, and numerous activities and field trips that keep our residents active, healthy and happy. Our team of professionals is dedicated to meeting the physical and emotional needs of our residents and to improving their quality of living. We all share the same passion for what we do as a living and we enjoy the abundant relationships and connections we make with guests, residents, families and the entire local community. Aside from around the clock care, we also afford residents the luxury of independence with the reassurance that helping hands are always nearby. Making the decision to live in an assisted living facility is a difficult process. We are confident that you and your loved one will find that the services, atmosphere and care that our home provides are truly unique and simply not available anywhere else. We encourage you to view our FAQ page to find answers about our home and about assisted living. We also invite you to visit Caregivers Inn to learn more about our services, staff and how we can meet your personal needs. Contact Caregivers Inn today! View our listing on New LifeStyles.